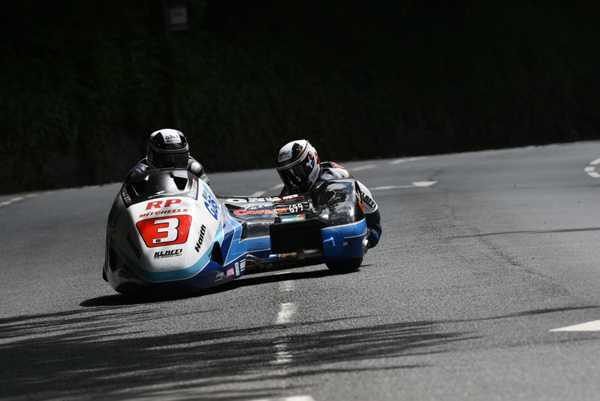 Ben and Tom Birchall took a dramatic victory in the opening Sure Sidecar race at the 2015 Isle of Man TT Races, fuelled by Monster Energy, coming home almost twenty five seconds clear of John Holden/Dan Sayle for their second TT victory. The duo won in a new race record time with Conrad Harrison/Mike Aylott taking third but there was disappointment for pre-race favourites Dave Molyneux/Ben Binns and Tim Reeves/Patrick Farrance who both went out on the first lap. It was all change at Ramsey as Molyneux went to the top of the leaderboard but only by the miniscule amount of 0.003s and Holden/Sayle were only a further half second back! Harrison/Aylott remained in fourth but had dropped to eleven seconds in arrears with Ian and Carl Bell moving up to fifth. Molyneux was soon reported as having retired at Brandish with fellow Manxmen Karl Bennett/Lee Cain also out at Douglas Road Corner. But the Birchalls were pressing on ahead and by Glen Helen, they'd extended their lead to eight seconds over Holden/Sayle with Harrison/Aylott continuing to drop further back in third, now some 19 seconds adrift. Holden briefly got the deficit to the Birchalls down to six seconds half way round the second lap but the Nottinghamshire brothers responded and, with a superb lap of 116.060 - the second fastest of all time - their lead had increased to 13.5s as they went on to their final lap. Holden had also set his personal best with 115.240 and was now 25s clear of Harrison/Aylott with the top six rounded out by the Bells, Bryan/Winn and Founds/Peters, the last named lapping in excess of 111mph in just their second year at the TT. The gap between the Birchalls and Holden remained constant all the way round the first half of the last lap but they eventually crossed the line a comfortable 24.1s ahead for their second TT win in three years with Holden taking his 12th TT podium. 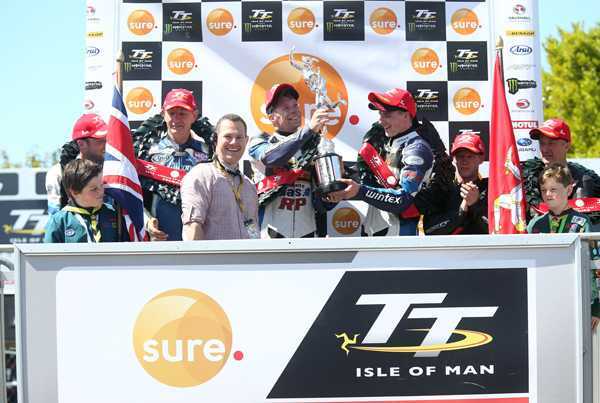 For Sayle, it was his ninth rostrum, the most ever recorded by a passenger at the TT. Harrison/Aylott were secure in third, the Bradford driver taking his ninth podium in the last ten races, with the Bells taking fourth ahead of Founds/Peters and Bryan/Winn, the gap between the last two just 0.007s.